Sakai Guides and DocumentationSakai Complete User Guide Tests and QuizzesHow do I edit my assessment title or description? 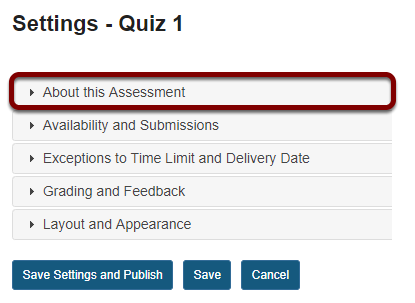 You can edit an assessment's title or description in the About this Assessment section of the assessment Settings. For more information on additional assessment settings, see How do I view and modify the settings of an assessment? In the assessment Settings page, click About this Assessment. To access the About this Assessment settings, click the section title on the assessment's Settings page. Change the Title of your assessment if desired. Add a Description. Anything you enter into the Description/Intro field will be visible to students before they begin the assessment. Notice that the Rich-Text Editor is available in the Description/Intro field. Attach a file if you like. The file could be a reference the students need to use during the test, or more detailed instructions on test taking requirements. Click Add Attachments to attach a file. Prev: How do I view and modify the settings of an assessment?